If you’re reading this, there’s a good chance you’re the kind of person who knows exactly what tactical urbanism is, and you’re probably pretty psyched about it. I’m that way too. My eyes light up when I see a twitter post about some new way a plucky average citizen can slow down cars and make way for pedestrians with nothing more than a few traffic cones or toilet plungers or a herd of plastic sheep. I love the radical idea that you don’t need to be a professional engineer or a traffic study specialist to make your neighborhood safer, even if just for a few hours—and that in the process, you can collect meaningful (if anecdotal) data that can be used to make a case for permanent changes. So when a few of my friends started tossing around the idea of doing a pop-up traffic calming demonstration in our neighborhood, I was excited to get involved. Cory clocks the speed of an oncoming vehicle. We did our demo this Saturday, and we did a lot of things right. A lot of things also went super wrong. Here’s what I learned from it all. Our traffic calming squad was a small one: just me, my neighbors Matthew and S.J., and a friend named Cory, who happened to be interning for our neighborhood community development corporation (CDC). Still, we had the support of the CDC, a full lending library of traffic calming accessories, a detailed resource guide from our local bicycle/pedestrian nonprofit, and all the enthusiasm in the world. So we had a choice to make: did we want to shoot for the moon, drag in some more volunteers, and really go big on this? Or would it be better to keep our ambitions small? 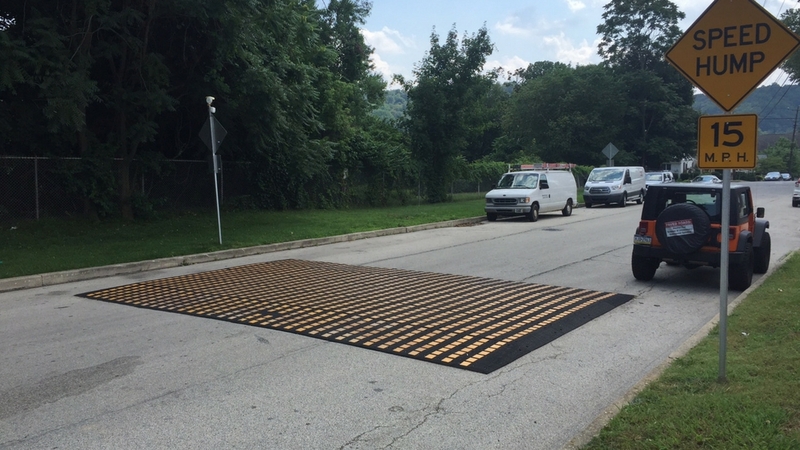 After a flurry of initial emails and ideas, we realized fairly quickly that even the most exciting traffic calming project is best done on a small scale. 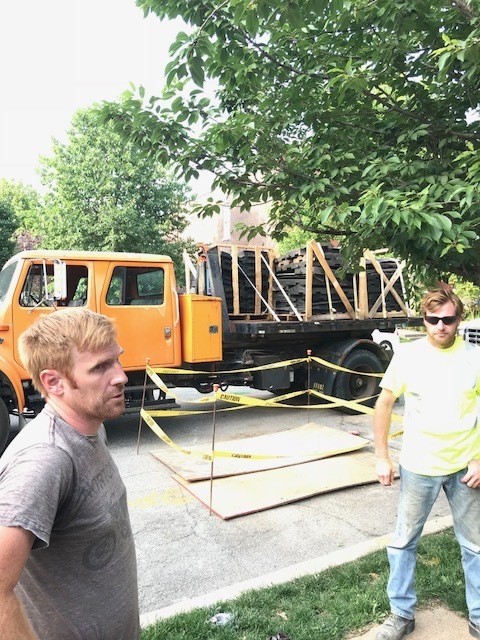 Our goal, after all, was simply to experiment and see if we could calm some traffic — and even though there were lots of intersections around the neighborhood that could stand to be calmed and a multi-block traffic calming festival sounded attractive, proving that we could calm just one would still be a huge win. And, real talk: we’d all been involved in enough casual neighborhood activities like this to know that roping in more volunteers could potentially be a nightmare of unanswered emails and last-minute flake-outs. It’d be way better to plan something that the four us could realistically accomplish — and if more neighbors wanted to jump on the bandwagon, that would only make the event better. We decided we’d focus on just one intersection, and showcase four possible traffic calming options that would be easy to set up: one per hour for a total of four hours, each with a fun, eye-catching theme. Not so long that we’d get bored and cranky with one another, not so short that we wouldn’t have any data or meaningful neighbor interactions to report. Simple, right? Well, it sounded like it. After we’d decided on our format, our next priority was to choose an intersection. Of course, we wanted to pick a block where cars tended to speed despite the fact that people tended to walk and bike there, too. But from there, we weren’t so sure. Should we go with one of our neighborhood’s stripmall-heavy mega-stroads, where the posted speed limit is north of 35 and the perceived speed limit is even higher? Maybe we could go to one of the underpopulated corners of the neighborhood, where we wouldn’t be as likely to see many pedestrians—but the ones we did see would be dodging cars tearing past stop signs? Eventually, we chose the intersection of California and Accomac. Located squarely in a populous residential pocket of our neighborhood, the block has one particularly unique feature: it sits immediately outside the door of one of our most popular neighborhood businesses, Lona’s Lil Eats. Lona’s is a small family restaurant that serves these amazing, massive rice-paper wrapped burritos stuffed with ingredients inspired by the chef’s (a.k.a. the eponymous Lona’s) native China, and they run a brisket smoker in the back that makes you instantly hungry the moment you step within a two-block radius. Needless to say, they get a lot of foot traffic. But that doesn’t mean that cars always take notice of the hungry diners traipsing across the street. Traffic is cut off to the southwest of Lona’s by a concrete cul-de-sac and there are no stop signs on this stretch of California, so the block is a one-way stop, with cars picking up speed as they zip from the north or south. Restaurant-goers attempting to cross the street to dive into a plate of cold glass noodles are often blindsided by through traffic moving at a fast clip. California and Accomac ended up being a great choice for our traffic calming adventure for another reason, too: Matthew, who was helping to co-plan the event, lived right on the corner. That fact would prove more important than we initially realized. In part because we’re all 20- to 30- somethings who are buddies (and in part because we’d read a lot about the importance of the human element in traffic calming), Cory, Matthew, SJ and I decided that we wanted to turn our traffic calming event into a bit of a party. When we started planning our four interventions, of course we started by thinking critically, combing through the library of available traffic calming props that our bike/ped advocacy had offered to loan to us for free and imagining how each of them would function in the space. But pretty soon, the puns start coming: a DIY tire-and-cone pedestrian island could be island themed, and we could hand out daiquiris and wear leis! We could borrow a few portable speed humps? Why not play the 2009 classic My Humps on repeat on a speaker and, I don’t know, hand out plastic camels or choreograph a dance? The word “chicane” sounded vaguely french; we could set up a french restaurant in each one and invite people to enjoy their Lona’s burritos in a little private dining area, complete with Matthew in a waiter’s outfit and a mustache bringing them wine! Of course, the restaurant would need its own name. Bienvenue a La Petit Chicane. Cory was a big Beatles fan, so we’d planned to end the day by painting an Abbey Road-style crosswalk in chalk paint on the ground and helping lunch-goers pose for photo-ops. And with a little bit of money from the CDC to load up on props and notepads to collect community feedback, we were off to the races. A week before our traffic calming adventure, we had a meeting with the city streets department regarding the temporary street modification permit we’d applied for. It was a simple formality, and the folks in the office were helpful, suggesting we place our chicanes a little further apart to keep everyone safe and advising we supplement our chalk-paint crosswalk with some traffic-cone bump outs. Sadly, we learned that a true pedestrian island wasn’t an option — the street was just too narrow to accommodate a middle-of-the-road stopping place for walkers — but they thought we could combine the crosswalk with a curb extension in a former parking space, and that would work just as well. Hey, whatever, we thought; as long as we could drink piña coladas and wear grass skirts, the clunkily named Pedestrian Curb Extension Island was fine by us. We asked for a portable speed bump. This is what we got. The city streets department signed off on our plan and told us they’d drop the speed humps off at Matthew’s house. We were surprised by the offer, but happy that our city cared enough to provide door service for free. Great job, municipal services! The night before the big day, Cory drove to the bike/ped organization to pick up the more portable props while the rest of us waited on Matthew’s porch for the miracle speed hump delivery. Hours passed, but we stayed relaxed, enjoying the summer evening and petting Matthew’s gregarious indoor-outdoor cat. A few more hours later, we finally called. A receptionist answered; of course, they’d get a truck right out to us! We didn’t realize...quite how big of a truck it would be. Apparently, something had gotten lost in translation, and the Streets Department hadn’t sent us the portable, low-weight speed bumps we thought we’d asked for, but a full scale, permanent, curb-to-curb speed hump system that had to be loaded by forklift, arranged in the street piece by 75 pound piece, and bolted down in a few dozen places. And, oh yeah, the delivery guys had no bolt gun and no instructions. I have no idea if our enthusiasm for the Black Eyed Peas’ seminal classic "My Humps" somehow confused the matter, but the moment these things pulled up, we knew there was a big difference between a hump and a bump, and more importantly, this wasn’t going to work. After the Streets Department truck had rolled away with Our Humps™ on it, we huddled up. We could try to find another intervention to replace them, but at the eleventh hour, it’d didn’t seem worth it. We were down to Le Petite Chicane, and a combo of the Abbey Road crosswalk and the Pedestrian Island Curb Extension. But two hours of solid traffic calming was still well worth our time. And then, of course, it rained. A mere ten minutes after I’d bought a non-refundable bag of island-themed tchotchkes at my local party store and set out on foot to the intersection, the clouds started to roll in. By the time the four of us had assembled, it was starting to drizzle. By the time the cones were out and the bistro tables were arranged inside the makeshift chicanes, it was starting to pour. Here’s the thing about a lot of tactical urbanism ideas: they fall apart in bad weather. All those pop-up balsa wood coffee stands and whimsical parklet festivals don’t do so hot when it’s hailing. We tried to tough it out for a while with umbrellas and rubber boots, talking up the few lunch-goers rushing between their cars and the front door of Lona's. But after a while, the lightning forced us all under Matthew’s front porch, and we became an indoor traffic-calming squad, pointing the nonprofit’s speed gun at oncoming cars and eating the french bread and brie we’d hoped to give to outdoor diners. I know, I know; this doesn't look like traffic calming. But Matthew's outfit is still pretty great. But here’s the other thing about when it rains on your traffic-calming parade: it’s sort of okay. Because our approach from the beginning had been a casual one, we didn’t lose out on much time or energy simply because the notoriously temperamental St. Louis weather got in the way. Saddest of all, my beloved pedestrian island never saw the light of day. But, hey: now I own all of this luau crap! I can totally do it another time. That’s the thing about pop-up traffic calming: it’s designed to forgive mistakes, bad weather, and human inadequacy — because all of those are a part of life. Too many of our cities are designed without that kind of slack built into the system; we barely demonstrate our proof of concept at all before we fire up the bulldozers and start pouring money into the ground. And I'll also point out what didn't go wrong during our pop-up: no one got hurt. No property got damaged. Drivers didn't even really get angry. The downside potential that cities might fear of letting their citizens take the lead in controlling traffic? At least for us, it simply wasn't there. If we want our citizens to have a meaningful input into the design of our cities, we should do everything we can to encourage them to experiment with shaping their streets themselves, even if their experiments aren’t perfect, and even if the rain washes it all away in the end. At least they’ll have a good time doing it.